Gatlinburg, TN really comes alive in the spring! As the weather warms up, our Smoky Mountain city is filled with special activities and events that visitors are sure to love. To help you make the most of your next getaway, Stony Brook Cabins has put together three tips for vacationing in Gatlinburg in the spring. Millions of people come to Gatlinburg each year to see the area’s breathtaking wildflowers. In fact, the Great Smoky Mountains National Park is sometimes called “Wildflower National Park”, due to the abundance of beautiful blooms in the region. April is considered peak season for wildflowers in the Smokies, with May and June coming in as close seconds. Cove Hardwood Self-guiding Nature Trail is a 0.75 mile loop trail with some of the best wildflowers in the Smoky Mountains. Little River Trail has wonderful flowers from mid-March through April. The Appalachian Trail features beautiful wildflowers from mid-April through May in the 2 mile section between Newfound Gap and Road Prong Trail. Porters Creek Trail is a great place to see wildflowers in the first 1.5 miles of the hike from late March through April. If you would like a guided tour of the wildflowers in the national park, try to plan your trip for mid-April so you can take part in the Spring Wildflower Pilgrimage. This annual event includes expert-led wildflower hikes and a number of special classes and programs related to spring in the Smoky Mountains. The Easter Sunrise Service at Ober Gatlinburg is an amazing way to celebrate the holiday in the Smokies. On Easter Sunday, the Ober Gatlinburg Aerial Tramway will offer free rides to the top of Mt. Harrison for a memorable worship service in the mountains. The Gatlinburg Beans and Cornbread festival in May is definitely the culinary event of the season! Local chefs will compete for the title of “Best Beans and Cornbread in the Smokies”, and attendees get to cast their vote for their favorite recipe. 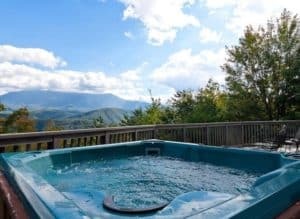 When you stay at a cabin in Gatlinburg in the spring, you will definitely want to spend a lot of time on your rental’s deck. The spring climate in the Smoky Mountains is ideal for sitting out on a rocking chair and taking in the views. Many of our properties come with hot tubs on the deck, so you can enjoy a nice relaxing soak after a full day of fun in town. Your cabin’s deck is also the perfect spot to enjoy a picnic-style lunch or a cookout with the whole family. To start planning your vacation, browse our complete listing of cabin rentals in Gatlinburg!